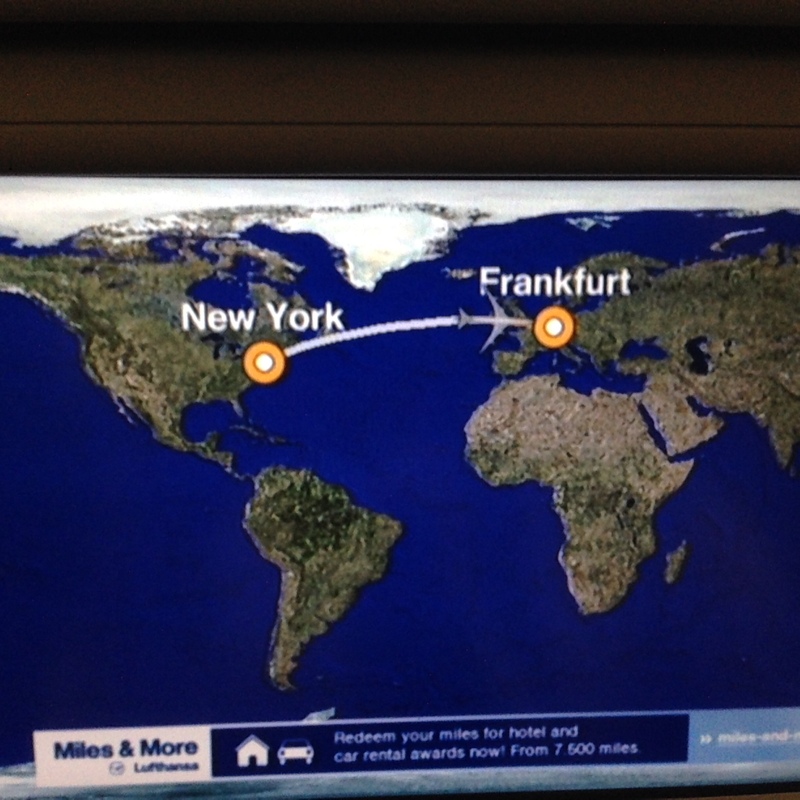 After 16 hours of travel, we safely arrived in Frankfurt. I saved money on our flight by using miles from San Francisco to New York but it made for a very long day! Thankfully, we have a direct fight home. This was my first time flying with Lufthansa, and it was a really great experience. The plane was 747-800, it was ginormous, and super nice! We had free movies, food, and they even offered a glass champagne to everyone shortly after take off. They handed out warm wet napkins prior to serving food, and their airplane food was decent. If you ever find yourself traveling to Germany, try Lufthansa! Getting through customs at the airport took only about five minutes and we easily found the driver from Infusio. I had no idea where we were staying since the apartments at Infusio were already booked. 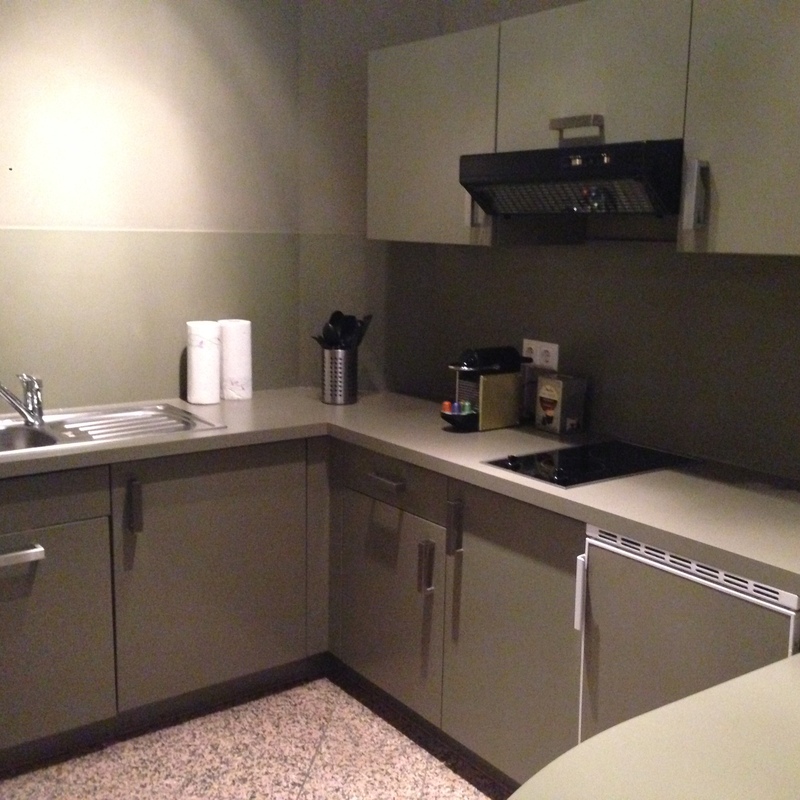 Thankfully, the apartment at the Couva Boarding House is in nice area of Frankfurt know as Nordend. There is a small grocery store across the street, and a variety of restaurants and cafes within a block. There is also a nice children’s playground near the entrance to Couva, complete with a merry-go-round and ping-pong table. Here’s some picture of the apartment. The apartment was very clean, and spacious. 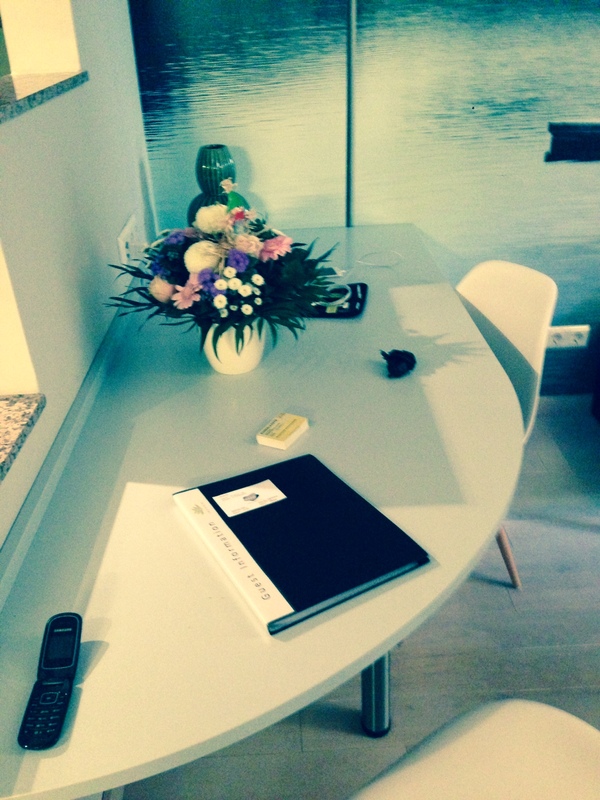 Jasmin, the executive assistant at Infusio, stocked the small fridge with some organic fruit and vegetables, and had a fresh flower arrangement in the room. There is also a roof top garden with picnic tables, a community kitchen and dining room, and a laundry room that you can use for free during your stay. The Friday we arrived was German Unity Day so most businesses, including Infusio were closed. Thankfully restaurants and cafes were still open. We took a long nap, had a quick meal at Heros Premium Burgers, and were in bed by 8:30 that night to catch up on the sleep. We slept in till 10:30 on Saturday! We woke up to a beautiful, sunny, warm day so we window shopped for a bit and had some great soup at 2A Noodle Bar. We decided to try some traditional German food for dinner, so we went to Mosebach. 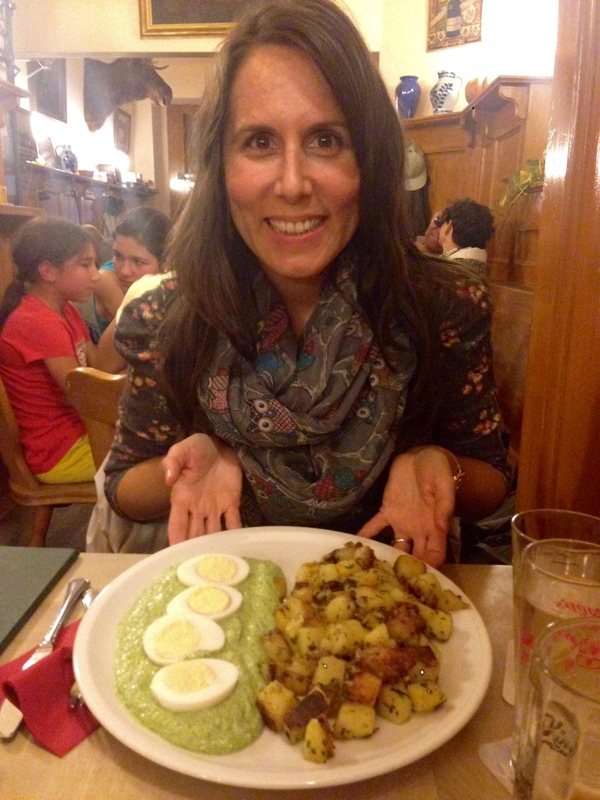 It’s a gastropub that serves traditional German Grie Soß (green sauce). It was a fun, local place and the food and green sauce was great! Here’s a picture of my traditional German meal. We were still very tired, so after dinner we called it another early night. Sunday we had more energy and took a short train ride to Heidelburg to explore. We were able to see the castle and spent about an hour exploring the downtown area. It’s a very quaint town, with narrow cobblestone streets, and is full of tourists, a Starbucks, Subway, and Hard Rock Cafe! We still enjoyed the few hours we spent there. 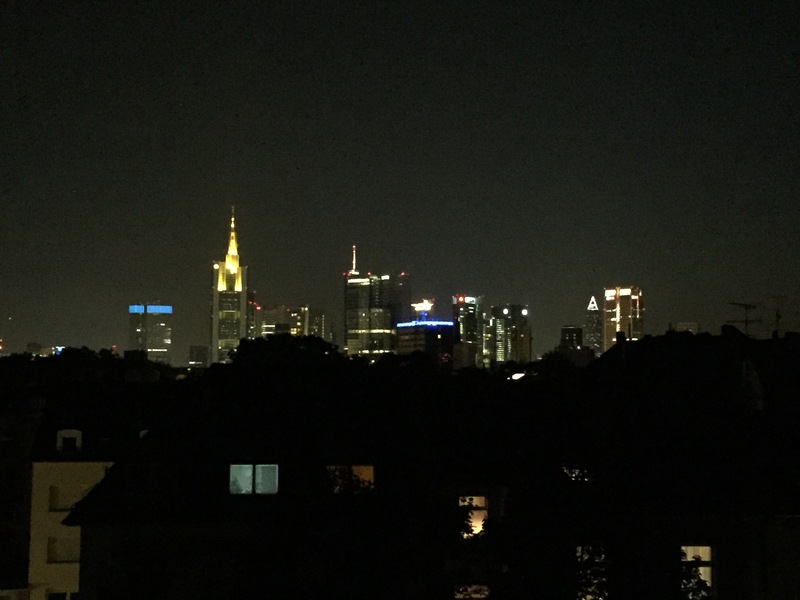 Overall, Frankfurt seems to be a very cool city. It’s much more diverse than I expected, it reminds me a lot of New York City. I’ve read that it’s sometimes referred to as “Main-hatten” because of the large amount of skyscrapers and high-rises in the downtown area. Here’s a picture of the skyline form the rooftop at Couva. It’s been nice to have time to acclimate to this time zone, and see a few things before I embark on my treatments at Infusio. I’m looking forward to getting started, and I’m trying not to be nervous! I hope to write updates on my treatments every two or three days as long as I feel up for it. Thanks for following me along on this crazy adventure! 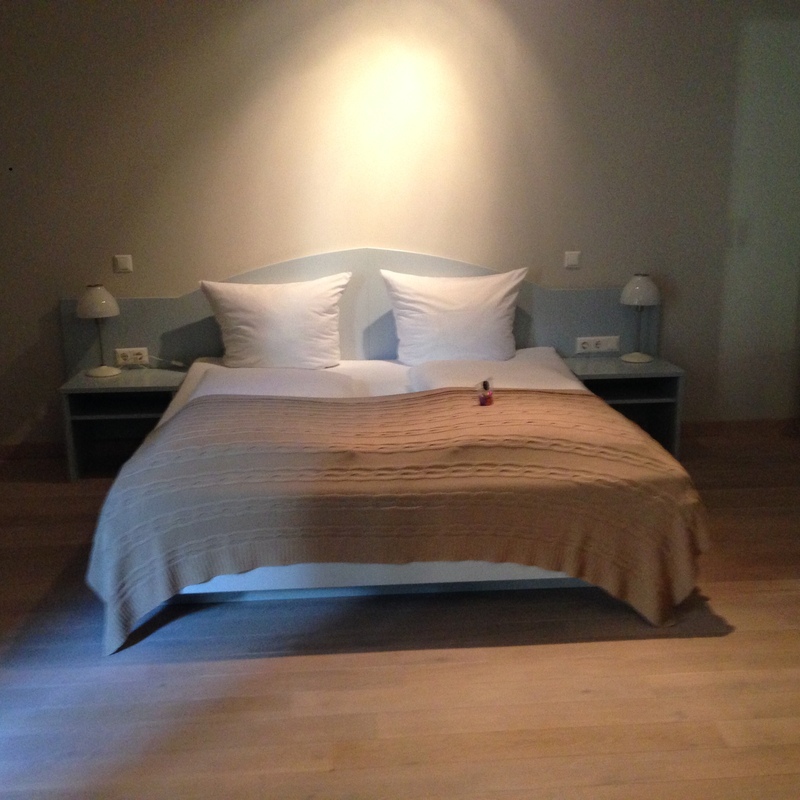 Categories: Infusio | Tags: Couva Boarding House, Frankfurt, Germany, Goodbye Lyme, Heidelberg, Infusio | Permalink. Thanks for taking us along on this journey! I love hearing your updates and imagining the scenes and experiences. Really happy for you!